Could you see a spaceship in orbit by day? In order to figure this out, we need to know the size of an aircraft carrier, how much light it would reflect, and have something to compare it to. Going in order - the largest aircraft carrier I can find is technically a supercarrier, and measures 77 meters wide by 333 meters long. This gives us a reflecting area of 25641 square meters (2.56 square kilometers - this thing is massive). In order to know how much light it would reflect, we have to know what it would be made of - on earth a lot of our marine craft are made of steel, which reflects 58% of the visible light that hits it. However, spacecraft don’t need to follow ocean rules exactly, so I’ve also considered the amount of light reflected off of aluminum, which is one of the most reflective metals out there; it reflects 91% of the light that hits it. So, now to compare to something concrete. Fortunately, we have a space station to compare to - the International Space Station. The ISS is 72 meters wide and 108 meters across, which gives it a total surface area of roughly 7776 square meters, or 0.7 square kilometers. Comparing this to the surface area of the supercarrier, we find that the supercarrier is 3.3 times larger in reflecting area. However, this doesn’t mean that the supercarrier is automatically 3.3 times brighter, since we haven’t taken into account how much light the ISS reflects relative to how much our supercarrier reflects. The ISS is designed to reflect as much light as possible, in order to try and best insulate the space station. 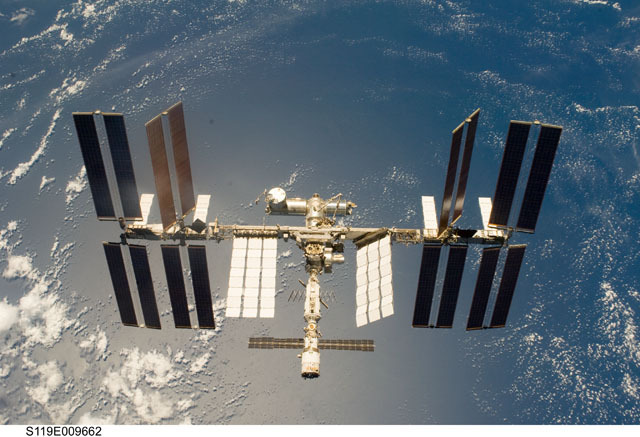 The space station, on average, reflects about 90% of the visible light that hits it - the solar panels are slightly less reflective than the main body of the station, since they’re trying to absorb sunlight to power the station. We’re going to want to compare the brightness of the ISS to the brightness of an object made of a different material, so we need to scale the brightness of the ISS by the fraction of light that’s reflected off of steel and aluminum. Aluminum reflects 91% of the light that hits it - the ISS reflects 90%: supercarrier divided by ISS will give us how much brighter (or fainter) aluminum is when compared to what the ISS is made of. These numbers are almost the same, so we should expect this factor to be almost exactly one, and it is: 1.01. Steel reflects much less light than aluminum, so we find that a steel space station would be only 64% as reflective as the ISS. Now we can scale the brightness of the ISS by both reflectivity and size - for steel, we find that an object 3.3 times larger, but 64% as reflective gives us an object that reflects 2.12 times the amount of light that the ISS does. For an aluminum spacecraft, it would reflect 3.36 times the amount of light that the ISS reflects. What does this mean in terms of visibility? A spacecraft the size of a supercarrier would be easily visible at night - it’s between 4.8 times (steel) and 7.7 times (aluminum) as bright as Venus. It would appear as an extremely bright star moving relatively quickly through the night sky. It’s also above the visibility threshold for daytime viewing. You can see Venus in the day if you know where to look, and since the supercarrier would be at least four times as bright as Venus, you should be able to spot the space craft during the day as well. However, it’s nowhere near as bright as the sun or the moon, so it wouldn’t necessarily stand out if you weren’t already looking for it. Something here unclear? Have your own question? Feel free to ask! Or submit your questions through the sidebar, Facebook, twitter, or Google+.